Drums and barrels containing hazardous waste must be labeled properly to comply with EPA regulations (40CFR part 262 & 49CFR part 172.300.) Our range of drum labels ensure workers handle and dispose of waste properly. 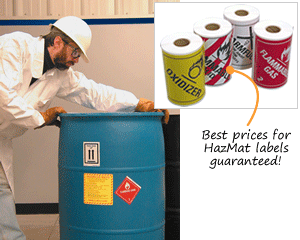 They also keep untrained personnel away from hazardous waste by alerting them to the danger and preventing accidents. • Labels with strong bond adhesive stick easily to plastic or steel drums and do not fall off. • Move your mouse over the designs below for a quick view of materials, prices, and features. As Low As 13¢ per Label! As Low As 14¢ per Label! As Low As 11¢ per Label! They got here quick! They’re nice and visible, you can write on them easily and they stick well. Sturdy and clear. Timely arrival.